One of the best parts of traveling is that you get to do exciting things that you wouldn’t normally be able to do. Festivals are the perfect opportunity to experience new things and meet new people. Sometimes these festivals can be expensive so make sure to save money by staying at a budget hostel with a prime location. In this way, you will save some valuable money you would spend on transportation. Here are three cool festivals and folk festivals you might wanna join! Music festivals have become increasingly popular over the years. One famous music festival is Ultra, which performs in various locations around the world. Ultra is a three day, outdoor electronic music festival. We recommend attending Ultra in Split, Croatia during the middle of July. When you’re done with your night of dancing, you can lay out on one of Split’s beautiful beaches. You can find affordable hostels for the Ultra Festival in Split. Split Backpackers and Old Town Hostels are both two fantastic places where you can get a quality stay at a low cost. Festivals can bring people together through art, music, food, and in Spain they spend a day throwing tomatoes at each other. What better way to get to know someone than by pelting them with tomatoes? La Tomatina, close to Valencia has been going on for decades and has become one of the Spain’s most famous celebrations, usually happening at the end of August. This festival takes place in Valencia, Spain where Gomio has many budget accommodation hostels. Try the River Hostel, a new hostel that is in the center of the city, or you could stay at Innsa Hostel that boasts its historical building. Both are clean and cheap hostels for La Tomatina. 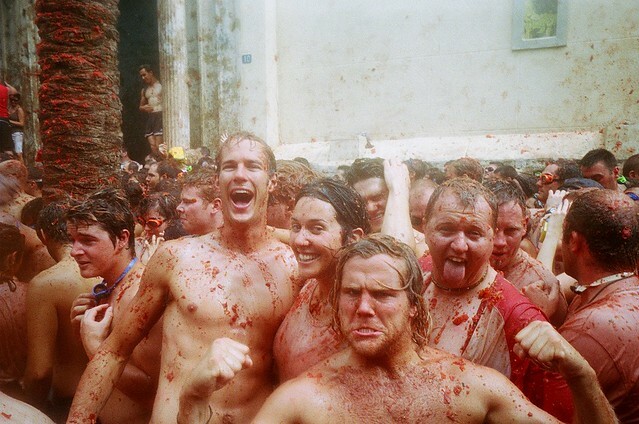 Those budget hostels are a good starting point for your La Tomatina celebration! For two weeks Germany holds the world’s biggest fair, with over 6 million people in attendance. It’s a 16-day-long festival, called – well, you know it – Oktoberfest! This Oktoberfest folk festival celebrates beer and has been going on for over 200 years. This festival is so popular that many other countries have created their own version of Oktoberfest modeled after the original in Munich. During Oktoberfest it tends to be difficult to find a place to stay in Munich. So, hurry up and book your cheap hostel for Oktoberfest 2013 now at Gomio.com. Euro Youth Hostel and Easy Palace Station are both fun hostels in the middle of the city that are perfect for your visit to Oktoberfest. Posted on 4 November, 2013 by Gomio.com. This entry was posted in Party and Fun and tagged Alternative Hostels, Backpacking, Beach, Budget Travel, Hostel Travel, Hostels in Germany, Hostels in Munich, Hostels in Split, Hostels in Valencia, Music, Party and Fun, Party Hostel.